Tasty cereal made from soy and wheat. A great source of dietary fibre, carbohydrates and energy plus it contains 18 vitamins and minerals and free from trans fats and cholesterol. 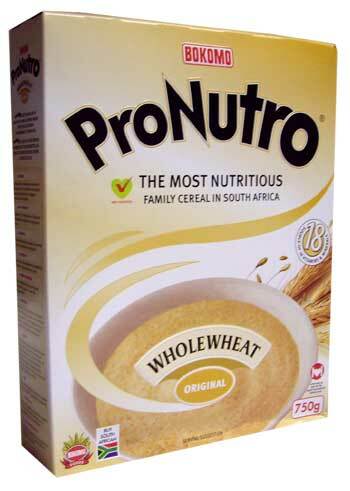 Pronutro is a great healthy cereal for all the family. Wheat Flour (69%), Soy (15%), Wheat Bran (7%), Sugar, Emulsifier, Chicory, Vitamins (A, B1, B2, B6, B12, Niacin, Pantothenic Acid, Biotin, Folic Acid, C, D3, E, K), Minerals (Tricalcium Phosphate, Potassium Iodide, Electrolytic Iron, Magnesium Oxide, Sodium Selenite Anhydrous, Zinc Oxide), Salt, Amino Acid. Delicious cereal. Miss it so much! The best out of all the flavours available.